The Hell Creek Formation is so much more than just Triceratops and Edmontosaurus and Tyrannosaurus rex. There, I said it. I head out there to swelter and dig nearly every summer, and it's truly not the big famous dinosaurs I'm interested in. This is where Jonathan comes in. This specimen, RMDRC 06-007, was collected over a decade ago and sat in our collections partially prepared for most of that time. Coincidentally it's a specimen of Thescelosaurus neglectus, the "neglected marvelous lizard" and the name sure fits. In the spring of 2017 we decided we needed to do something with the specimen. Jonathan was mostly articulated in a large heavy field jacket. The first step was to get all the parts into a state where we could mold them, so lots of careful preparation, and lots of consolidant was required. Jonathan was a large (by Thescelosaurus standards) and old animal, but the bones were still preserved with the insides like coffee grounds, ready to pour out in a pile of disappointment if the bones were even looked at the wrong way. Any damage was stabilized and repaired as we worked. Missing parts were scanned with an Artec Spider structured light unit and we printed them out using our Form2 SLA printer and the usual PLA filament scribblebots. Molding was quick and straightforward for the most part, though the chest cavity posed a special problem for us. The chest cavity preserved a series of calcified intercostal plates between the ribs, which only start to solidify when the animal hits a ripe old age. These super delicate features prevented us from molding a set of ribs that could be immediately used on the cast, so instead we molded them all as a whole unit, cast them, then modified the casts to fit on the mount, then remolded them. Straightforward, right? Assembly was pretty easy as well, though at nearly 14 feet long we were always remarking on how surprisingly big this animal was. 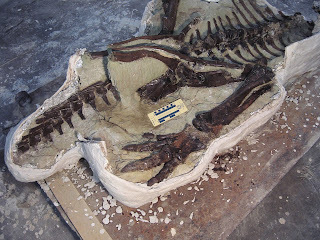 It's huge clod-stomper feet came out very well, and since we had calcified cartilage with the specimen, we thought it would be dumb not to include it on the finished mount. In the end we came up with what I think is the very best and most scientifically accurate reconstruction of this poor neglected animal ever attempted. I hope you all like it as much as I do. He just looks so dang HAPPY!